Born in Shipley, West Yorkshire, David was introduced to music at an early age. 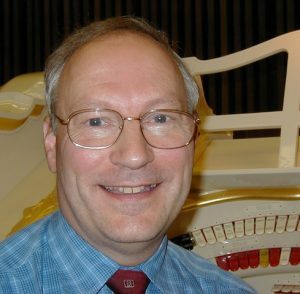 He became assistant organist and choirmaster at St Peter’s Church Shipley while still in his teens. He was featured as house organist from June 1965 at the Gaumont (ex New Victoria) Bradford. Playing at the new Silver Blades Ice Rink, Bradford led to his moving to London (after a period at Bradford University) as resident organist and circuit MD at the prestigious Silver Blades Streatham. In 1970 he returned to Yorkshire to develop a family business with freight barges, passenger and restaurant boats, waterbus etc. He continued in the ice rinks, broadcasting, and giving concerts, plus coaching youngsters. In 1980 David returned to Streatham Ice Rink, before moving on to the new Lee Valley Ice Centre, Leyton, as Musical Director until 1990. He became custodian of the famous Trocadero 4-24 Wurlitzer and had spells as COS London District Secretary, Musical Adviser, Projects Officer and national Chairman, also giving concerts in the UK, Europe, Australia and the USA. Back in Yorkshire he also had a period as Yorkshire District Secretary, then project managed the move of the COS Northern Wurlitzer into the Ritz Ballroom, Brighouse, plus subsequent enlargement/improvements – this organ is now installed in the Victoria Hall, Saltaire. He has made three commercial recordings, on the Conacher at the Regal/ Odeon/Scala Rotherham (which he played for a time in the 1970s), and the Wurlitzers at Tywyn and Clydebank in more recently issued CDs. In his spare time David works part-time as a rail and waterway consultant, and volunteers with the Talyllyn Railway in Tywyn, Wales. He is active in inland waterway matters and spends a lot of time maintaining and operating his historic 1929 and 1934 Narrow Boats which are based at Leeds and The Black Country Museum, Dudley. He is a member of the Canal & River Trust Yorkshire & N.E. Advisory Board and the CRT Freight Advisory Group and is part owner of two 500 tonne freight barges.